The Neumann KM 184 a small diaphragm condenser used primarily in the recording studio. Its small size and great response to high end frequencies make it the industry standard for recording drum overheads. It is sleek in design and like all Neumann microphones it is made extremely well, all with top end parts. It has a cardioid polar pattern. I've been using KM 184s for about four or five years and I have yet to find a pair of small diaphragm condensor microphones that sound better than these. While they are pretty much the industry standard for recording drum overheads, they also sound great on acoustic guitar, violin, mandolin and any other instruments that needs a microphone that will pick up the silky high end that is essential when recording these types of instruments. They also sound good on any other type of cymbals or any other acoustic stringed instrument when you want to pick up that high end. Also great to use in tandem with a large diaphragm microphone to make sure that you get the full range of sound coming from the source. I can't think of any other small diaphragm microphones in this price range, but would compare these to the much cheaper Rode NT5s. While the KM 184s are considerably more expensive than the NT5s, the sound quality is much better. I would also compare these mics to their sister mic, the KM 84s which are the older versions of these mics. While they sound pretty similar, the KM 184s are just as good. 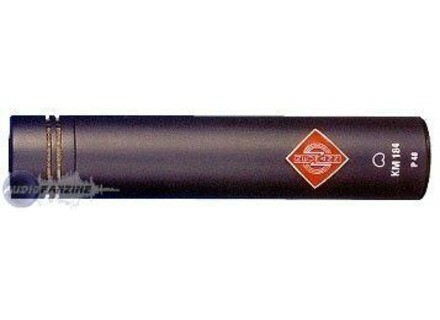 Neumann makes top of the line microphones and these microphones will last a long time if you treat them right. It is an investment that is definitley worth it if you are looking for some of the best small diaphragm condenser mics around. This is a small diaphragm condenser mic, often called a pencil mic. They are condensers so they require +48V phantom power in order to work. You connect them with a standard XLR mic cable. These have a set pickup pattern, which is cardioid. The KM line does come in other pickup patterns, so beware in case you are under the impression that these have switchable patterns, like I was for a while. These are pricey and very high quality, so if you take them out of the studio you will want to be very careful. I was once in a session where one hit the floor, and it was done for - so you can be sure that they are pretty fragile. I have been using these for many years, they are somewhat of a staple in many studios. These are some of the best you can get for small diaphragm condensers. The sound you get from these is totally crystal clear, and putting up two of these and recording in stereo will get you a truly realistic stereo image. For that reason, they are also sold in stereo pairs. Since they are small diaphragm, these are great with high frequencies and transients. Because of that they are very well suited to use as drum overheads, and stereo mics for a piano. I especially recommend using these on piano - they can really help highlight those harmonics and overtones that can unfortunately can get lost with a lower quality mic. These will also usually come with a detachable wind screen, mic clips, and a nice wooden box from Neumann. These mics are also my secret weapon for recording acoustic guitar. Put one of these on the neck of the guitar, and a large diaphragm condenser on the body and you're in heaven! These are expensive but definitely worth it if you want the best. I would get them again in a heartbeat. Small diaphragm for acoustic and maybe more. I have not lived an old fox studios but I leaves quite well educated. This mic has undeniable strengths and you can hear at first listen. It is clear, detailed and accurate. Then we may not like his signature sound and that the KM84 was velvet and it pulls you eardrums. Still, the little music that lets us hear sounds terribly pro and relatively low prices. I use this microphone as the capture of cello, violin and also head over studio / stage. For acoustic guitar I prefer a couple of AB U87 or C414 with Drawmer 1969. As someone said in an earlier opinion, I also liked the sound of the organ of St Jacques at Luneville preamp with SSL. I bought this microwave in 2002 and I would do this choice. I can only compare the static park my C414, AT4040, U87 ... and I'd like to compare it to Shure or Modeled Shoeps MK2 with prémplis Chandler, Neve .. The "bump brightness" sometimes critical (compared his prdcesseur) works wonders when recording in places trsrverbrants, such as churches. CHARACTERISTICS This adds a directivity quite similar across the spectrum, making it an excellent choice as a couple Stereo base in these circumstances.